The NHL season is winding down toward the Stanley Cup Final. Major League Baseball is swinging into top gear. The NBA is in playoff mode right now as well. That means it is the perfect opportunity to experience the great stadium food items that are available in professional arenas across the United States right now. Arena food is about as bold and arrogant as most of the world sees Americans. It’s flavors are incredible, the fat counts are generally higher than a weather balloon, but the only guilt that is felt comes from the checkbook when you realize you’ve spent more on the food than on the tickets to the game. Forget going out to the ballpark to get some peanuts, hot dogs, or Cracker Jack! These are the best stadium food options available right now. Anyone can buy some French fries and dunk them into some ketchup or some fry sauce. 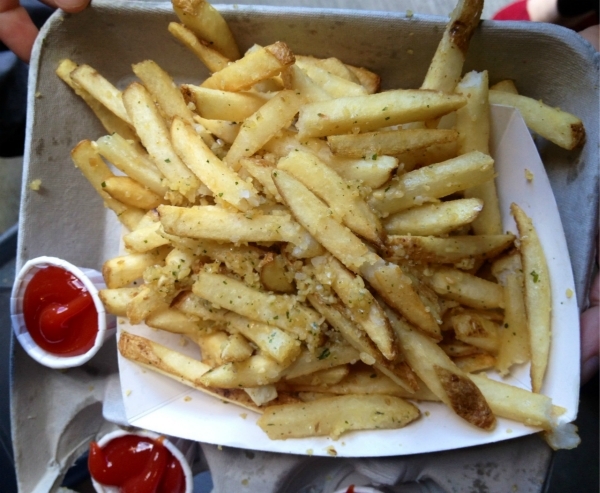 It’s only at the home of the Seattle Mariners where you’ll find the amazing garlic fries for sale. It’s a pretty basic formula: cut strips of potatoes, fry them up nice and crisp, and then mix in some minced garlic and do a quick pan fry at the end. You’ll find this beauty for about $10 and if you pair it with some local fried fish and tartar, you’ve got a heavenly combination that will have you hoping the game goes into extra innings. 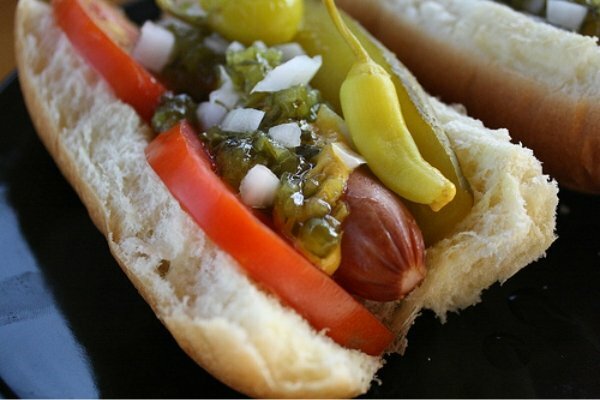 The home of the Chicago Blackhawks has one of the best ways to get the Chicago dog done right – your way. You can load this baby up with all of your preferred fixings, condiments, and if you’re really nice and don’t mind paying a little extra, you can get a second dog thrown into your bun as well. Here’s a pro tip for you: if you don’t lose something while trying to eat your dog, you’re doing it wrong! The best way to describe The Beast is to call it the turducken of meat that you put on a bun and shove in your pie hole. It’s a wedge of a hot dog that’s been placed into a bratwurst. To keep these two meats together, you get it all wrapped up in bacon. 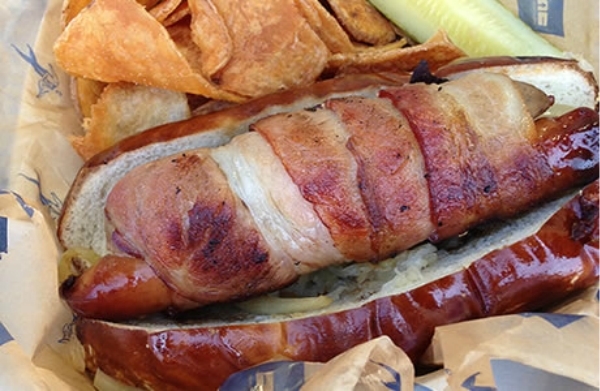 It’s then smothered in sauerkraut and onions and is complimented by a pretzel bun. Oh yeah – it’s also a footlong! Add some mustard and you’re ready for the game. The whole thing costs just $13. At the home of the Thunder, it is good to arrive a little early before the game begins so you can snag something good to eat. 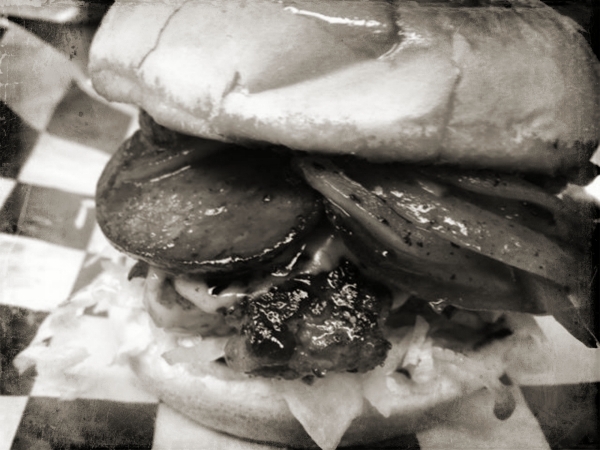 There are plenty of great options available, but maybe the best is the Okie burger. It’s a classic that you can find in the region and there’s even a whole chain restaurant dedicated to this burger delicacy! Be brave and go for the triple, get all the extras, and make sure you’ve got plenty of extra napkins! 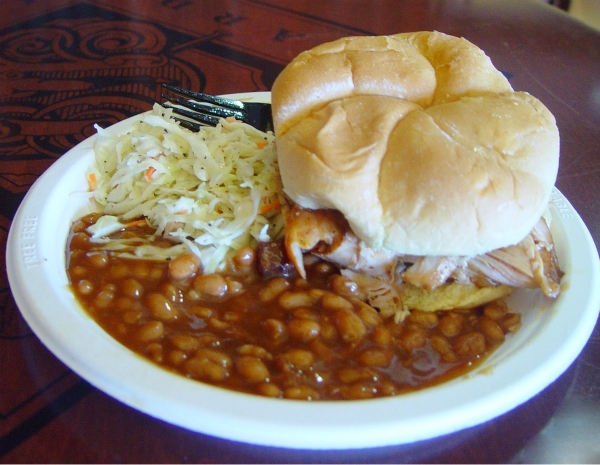 Whether you want the fun of meeting a former first baseman Boog Powell or you simply want the world class turkey, beans, and slaw combo that you’ll get from his stand, plan on showing up really early at Boog’s BBQ in Camden Yards. The line starts forming almost as soon as the gates open and it won’t die down until the game is approaching the end. You can get your picture taken with Boog if you want as well and get an autograph after you make a purchase, but you’ll probably just be stuffing your face by that time. 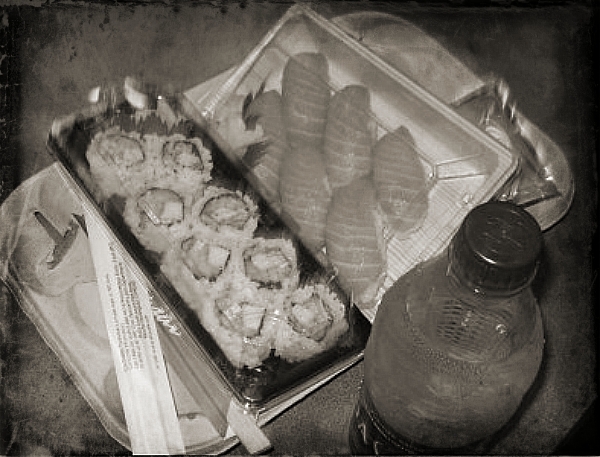 There’s just a California way of doing things and a visit to the Staples center means picking up some sushi to enjoy during game time. Forget that crazy California roll that is filled with krab – yeah, the fake stuff – and go with the dragon roll. Get a combination if you’re really looking to be adventurous! Either way, if your team does poorly, the wasabi is a good excuse for the tears that might be flowing at the end of the game. It’s tastes exactly like it sounds. 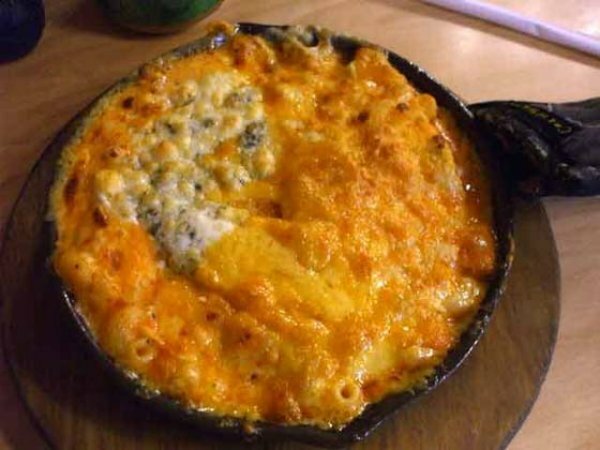 You’ve got yourself some buffalo chicken, some macaroni and cheese, and it’s baked the old-fashioned way in an iron skillet. There’s a reason why Food Network featured this item some time back and it’s just gotten better since! Your mouth explodes with cheesy, gooey, fiery flavors that are unique, awesome, and will have you begging for more than just one cup of this stadium delicacy. It’s been replicated at other stadiums, but nothing compares to the original. Nothing. It’s really easy to screw up a baked potato. You either don’t cook it long enough or you cook it for too long. It’s either chunky or it’s flat and either are bad enough that no amount of sour cream, cheese, chives, or prayer is going to be able to save it. 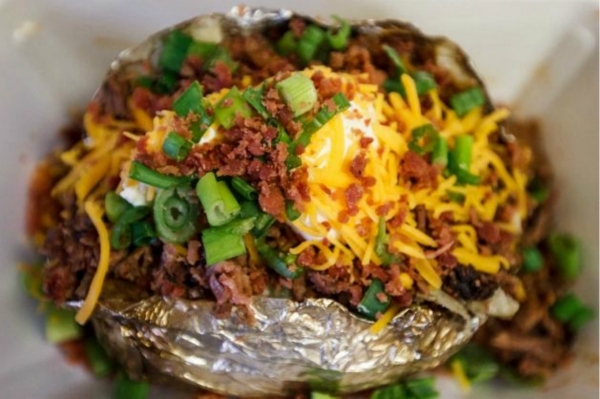 With the BBQ baked potato, however, you get perfection every single time. Pulled pork, barbecue sauce, a few onions, some cheese, a glob of butter and sour cream, and top it off with some jalapenos. It’s so good, you can’t eat just one… and forget about sharing! What goes better with a 100% beef hot dog than some pepper jack cheese? 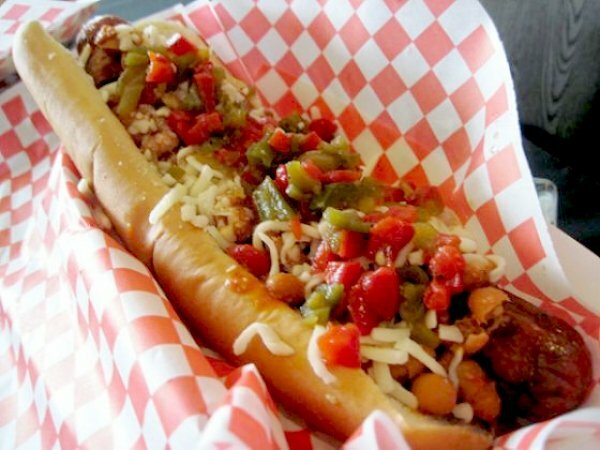 At Angel Stadium, you’ll find out because this monster is a footlong experience that is also topped off with chili relish, pico de gallo, and charro beans. Did we mention that the dog is also fully wrapped in bacon? Pile that dog up high and get prepared to light up your own halo with this beautiful offering! What are your favorite foods when you head out to the stadium? Did yours make this list? Share your favorites with us below!